Water Treatment Walks performance, Day 1 of 5: Bontgoch – Bow Street – Rhydypennau – Dole – Llandre – Bow Street. Collecting tap water from or near the Bontgoch treatment works, I will begin this five day walk following (almost exactly) the route of the mains water pipelines (bulk and distribution) as they serve this area of North Ceredigion. 16 miles. 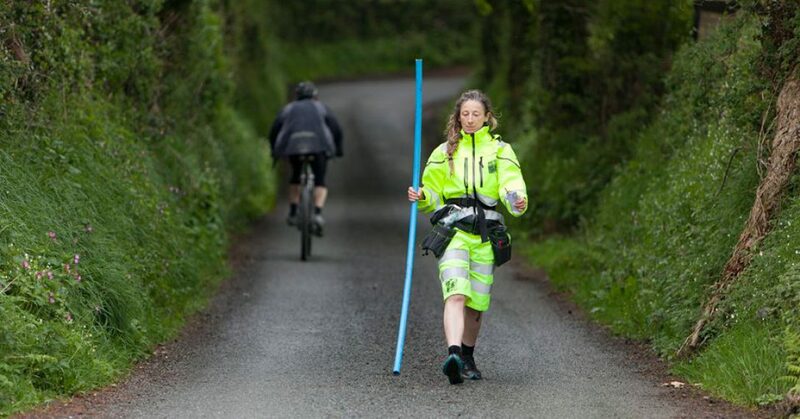 Water Treatment Walks performance, Day 2 of 5: Bow Street – Rhydypennau – Llandre – Bryn-bwl (Clarach Road) – Dôl-y-Bont – Borth. Carrying on from where I finished the day before (Bow St Post Office bus stop) I’ll continue my journey, following on foot the mains water pipeline network. Today, I’ll pass through Llandre, crossing over Bryn-hir to the back road from Clarach to Borth, before heading back to Dol-y-Bont, to get the train home from Borth. 11 miles. 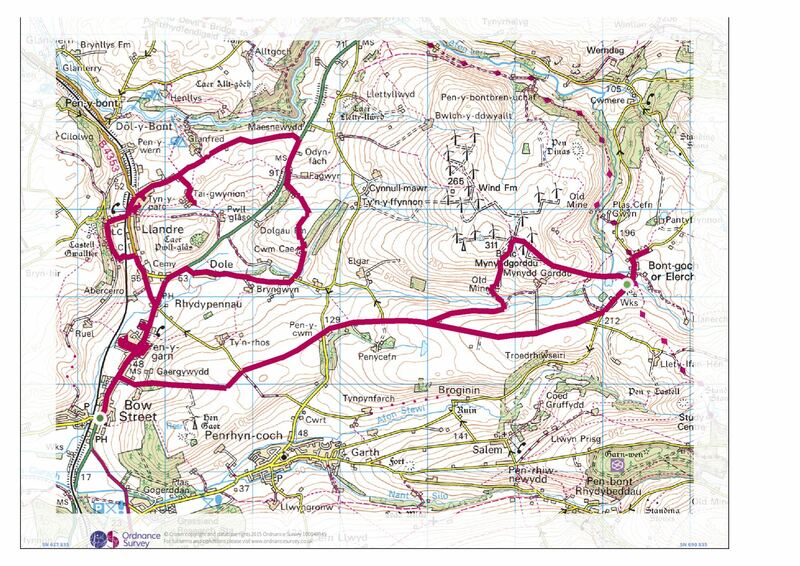 Water Treatment Walks performance, Day 3 of 5: Maesnewydd (A487) – Tal-y-bont – Taliesin – Tre’r-ddol. Carrying on from the northern-most point of the water pipeline network reached so far (Maesnewydd on the road between Bow Street and Tal-y-bont) I’ll continue my journey north to Tal-y-bont. Today, I’ll follow the water pipelines as they serve the houses of Tal-y-bont and surrounding area, before walking up through Tre Taliesin to Tre’r-ddol where I’ll host a ‘water surgery’ at Siop Cynfelyn from 3-6pm. 9.5 miles. Water Treatment Walks performance, Day 4 of 5: Tre’r-ddol – Llancynfelyn – Ynyslas turn – Borth. Carrying on from where I finished the day before (Wildfowler Bus Stop, Tre’r-ddol), this penultimate day will take me through Llancynfelyn, heading east towards the sea, but officially finishing at the Ynyslas turn just after lunch, to nip down along the Leri into Borth for another ‘water surgery’ in the afternoon (venue/times tbc). 7.5 miles. Water Treatment Walks performance, Day 5 of 5: Borth – Ynyslas. The final day of my journey, walking along the entire mains water pipeline network between the Bontgoch treatment works to the sea at Ynylas. This final day, I’ll walk from Borth (Heol Aberwennol bus stop) to the finish – the ‘last tap on the line’ – at the Ynyslas visitor centre. 9 miles. Total length: 55 miles approx.